Whether you plan to pile it atop a freshly baked tortilla chip or drizzle it on a mouth-watering burrito, nothing spices up your food quite like these Muy Fresco 3.8 oz. medium salsa portion cups! This salsa adds the perfect fresh taste to any dish. A medley of only the best peppers, onions, and garlic intermingle to create the perfect balance of zest. This delicious blend also features a hint of jalapeno peppers, providing a medium spicy kick for your customers' taste buds. This salsa is packed in 3.8 oz. portion cups with an easy-to-remove lid that seals in flavor and freshness. The cups are the perfect size for a serving of nacho chips, and your guests can easily carry them throughout your venue. They're also perfect for schools and other institutions looking to regulate and moderate the amount of food being served. 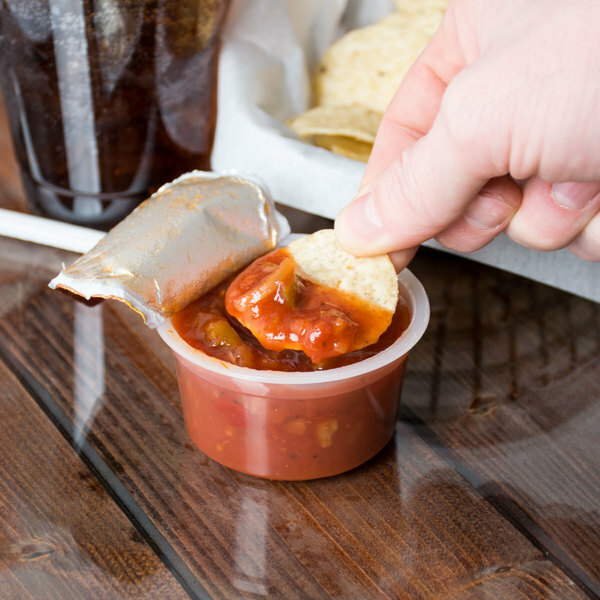 Rather than portioning out certain amount of salsa per serving, these portion cups couldn't be easier to serve! 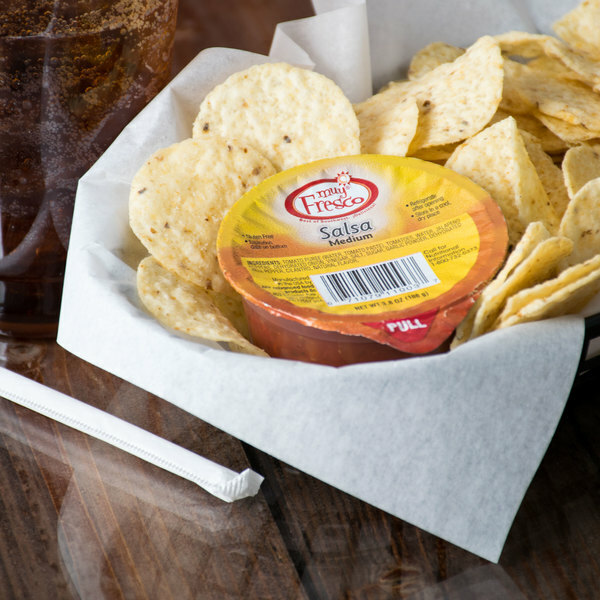 Increase your transaction time and lessen your kitchen prep time with these medium salsa cups. Delish tasting salsa with great single serve cup that are great for our deli. Great for serving with our tacos and other Mexican food items. Pretty good salsa in a small cup. My only complaint is it is a very mild medium salsa. It was really good mixed with the cheese cup also! My favorite snack for work is chips and salsa. I cannot find salsa individually portioned at my grocery store so I ordered this. The salsa tastes great and just enough spice. These small salsa's are so great and convenient to have. It's just enough to have at snack time. No having to store and reopen jars. Always fresh! A very tasty medium heat salsa cup that is great for dipping quesadillas or topping tacos. The salsa has a great texture and fresh flavor. 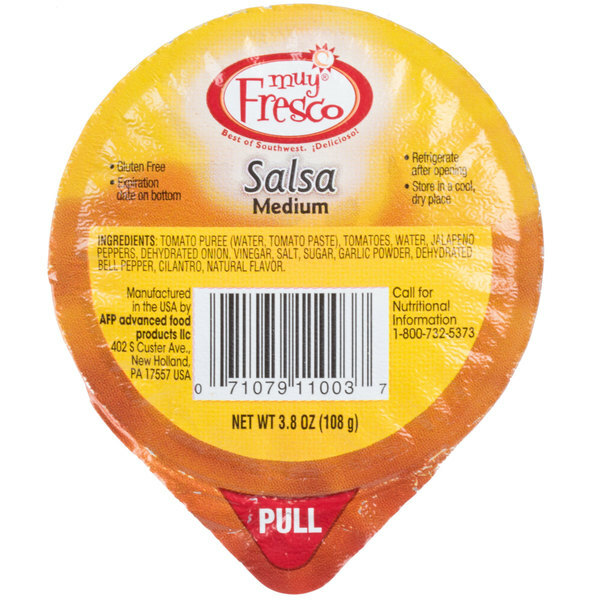 A very easy way to serve salsa on the go with Muy Fresco's medium salsa cups. The salsa taste great and is the perfect amount of heat. These are nice not just for commercial use, but also home use. The individual serving sizes are nice, saving on fridge space, since you don't have to open a whole jar just for a bit of salsa for an omelette or burrito. The price is good, and the quality and flavor are as well. 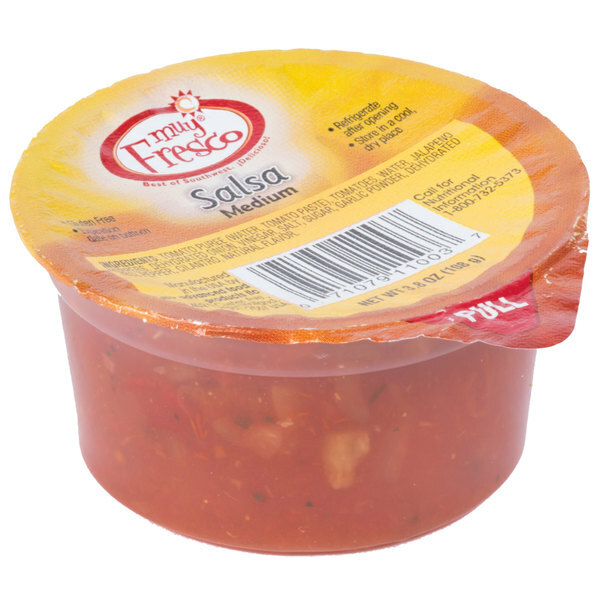 A nice quality portion control cup of salsa that is great for Mexican chips or dipping quesadillas. The salsa is not too spicy and we love it at our concession stand. A great salsa bursting with a fresh and wonderful quality flavor. It is perfect for serving with chips and quesadillas. I love the small portion cups. I like this salsa a lot. Just as good as name brands. I use it to serve with quesadillas and chips. It has a great kick to it! I love these little individual cups of salsa. 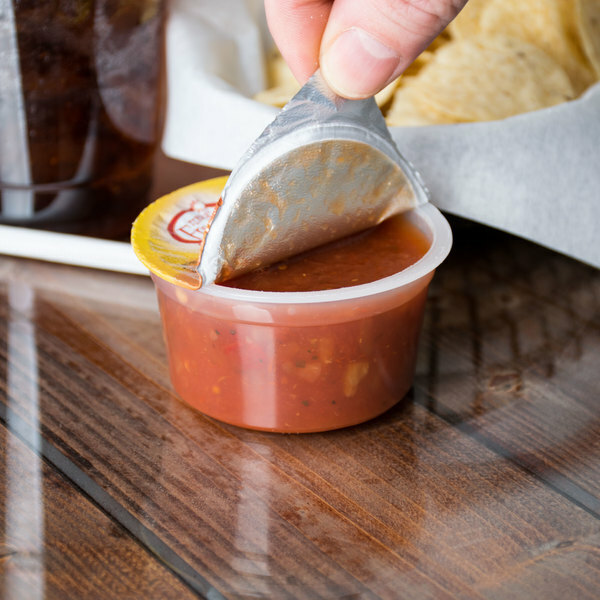 They are perfect for our to go orders of burritos and allows for a quick addition instead of dipping out into your own plastic cups and putting a lid on it. Has a really great flavor. This is a great-tasting salsa, although I wish it were a bit hotter, for being labeled a "medium" salsa. It has great tomato & pepper flavor and the portion size is very good as well. Amazing tasting salsa! Wish the shelf life was a bit longer but it is what it is. They are very flavorful and customers seem to enjoy them. Nice and easy to put into lunches as they come sealed and portioned. Amazing bright red color and fresh taste, though not very hot, still tasty. These also have some sugar in them but not much.